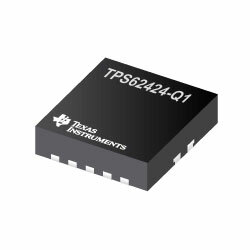 The Texas Instruments TPS624xx-Q1 family of devices are synchronous dual step-down DC-DC converters for automotive applications such as ADAS. They provide two independent output voltage rails powered by a standard 3.3V or 5V voltage rail, with fixed output voltages optimised for powering the CMOS imager or serialiser-deserialiser in ADAS camera modules. The EasyScale serial interface allows output-voltages modification during operation. The fixed-output-voltage versions support one-pin-controlled simple dynamic voltage scaling for low-power processors. The family of devices works at 2.25MHz fixed switching frequency and opens the power-save mode operation at light load currents to sustain high efficiency over the complete load-current range. For low-noise applications, users can force the devices into fixed-frequency PWM mode by pulling the MODE/DATA pin high. The shutdown mode decreases the current consumption to 1.2µA, typical. The devices enable the use of small inductors and capacitors to deliver a small solution size.